In March 2014 Empire Avenue started The Empire Avenue Leaders program to enable members to take full advantage of everything the site has to offer , supercharge their online networking and to have a voice in the development and progress of the site. Happy birthday leaders! It's been a full year since we launched the Empire Avenue Leaders program. You ALL stepped up to support EA... some by volunteering your time and talents and every single one of you by paying to join the Leaders. Everyone at Empire Avenue is pleased and amazed by your outpouring of support for the game. The Empire Avenue Leaders group now has over 890 members all of whom made one payment of $100 to join and enjoy the benefits . 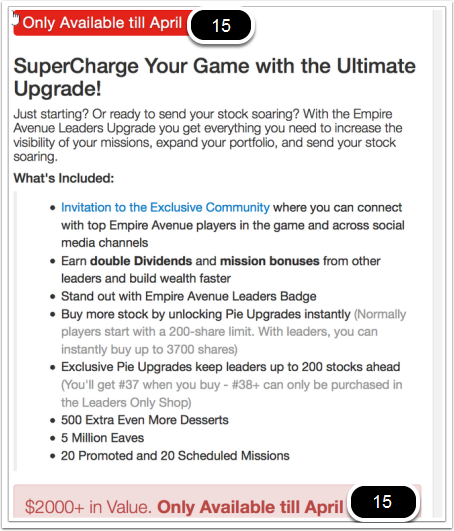 The Empire Avenue Leaders group now has 967 members , can we make it to 970 ? ?